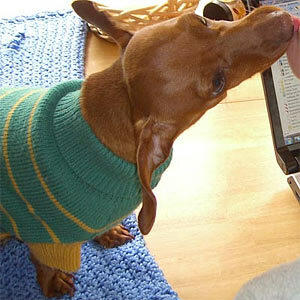 All dogs love to lick, but especially the Dachshund! Licking is a natural behavior in all dogs. Having had two dogs before, this was no surprise. What was surprising was how much Sampson (our mini Dachshund) loves to lick our face. When we come home and jumps on our lap he is always so excited, slathering us with ‘kisses’. Speedily licking whatever he can reach, be it a mouth, chin, cheek, or nose! Dogs, in general, are pack animals. But Dachshunds were bred to be hunters and as such, they have an even stronger bond toward ‘the pack’. When Dachshunds are puppies, they nurse from their mother. According to Dr. Caroline Coile, Ph. D., in her book, “Dachshunds (Barron’s Dog Breeds Bibles)”, in the wild, once these puppies were weaning, they would run and greet adult Dachshunds returning from the hunt by licking at the adults’ mouths. They would do this in hopes of getting the adult to regurgitate some of the meal they had just eaten. In this way, the puppy would start to eat solid foods from the adult or ‘higher ranking’ dog. Even as the puppy gets older and the food sharing is no longer an issue, you will often see a submissive dog lick the mouth (or ears) of an alpha dog (at home, YOU are probably the alpha dog in his/her mind). Just as most domestic cats carry the ‘kneading’ behavior with their paws (that they learn from nursing as kittens) into their adult lives, so domestic dogs have continued the ‘licking’ behavior. Only today, instead of licking the mouth of the Dachshund returning from the hunt, today’s domestic Dachshund will lick the mouth of a dominant dog or their “human”. So you see, your mini Dachshund licking your mouth is not just a ‘kiss’, but he/she is actually acknowledging your leadership. His licks are a sign of reverence and respect. You are, in his mini Dachshund eyes, the pack leader! See the article, Dog Licking. Gee so it’s not just my dog! I thought maybe it was because I tasted good to her! I’m just kidding. When she licks my face I can almost feel the love waves coming off her. I just found your Blog. It appears to be a good one and i like it. 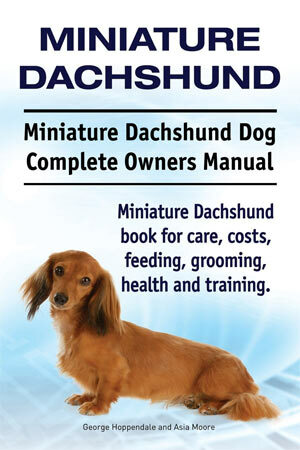 to me there is no such thing as enough info about the dachshund breed. I’m an old guy who for most of my life did not like Dachshunds and had no use for small dogs at large. I was a big dog person. I did not like them because they were always so aloof with me. I did not know that they save their love for their family. Dolly is my Doxies name. We got her in a very unusual way that would take far too long to tell here. The condensed version is that she was my neighbors dog. She hated me as only a Doxie can when she first saw me. I ignored her and she barked at me for over a month. Things changed, the neighbors dot divorced, the man moved out, and next thing I knew Dolly got it in her little head that I would be her new owner. I’d spent that summer becoming buddies with her. She is ours now. She is THE best dog I have ever owned and I have owned some very good ones. She may have a small body but her heart and soul is that of an Irish Wolfhound, the largest dog breed in the world. I have a special love for intelligent critters. She is smart and is sensitive to my needs. I’m slightly disabled. We have spoiled her but in return she has spoiled us more than we spoiled her. That’s a beautiful story Carl. We’ve only had our red mini for 10 months. She is the greatest and the smartest and most eager to please of our three other assorted breeds. I am happy for you! God bless you and enjoy Dolly! Love our daughter Dapple and the other black doggies. When they come to visit its licks cuddles and more licks. When I sit the Dapple (ivy) is as close to me as you can get or on me. The other (Ruby) is a Princess very quiet after the kisses but ivy searches for the ball. I’m sure she was a soccer player in the past. Affordable Loving Smart Big Heart is a small part of them. Michael. Cape Town. Great story, Carl. Very typical for Dachsies. We’ve owned many over the years (all rescues),as well as Greyhounds. The two breeds couldn’t be more different, but they actually get along wonderfully. Dachshunds will kiss you forever, but you can’t GET a kiss from a Greyhound. Go Figure. My dachshund Foxy has been constantly licking. But it is only her own mouth that she licks. It’s almost like what we do as humans scratching the roof of our mouths with our tongue. Now I have noticed an bad Oder in her mouth. I have looked an I don’t see anything different in her mouth. Has anyone ever had this happen? @Concerned, when our dachshund is licking (his own mouth) as you describe (and they do that… it’s normal), he is cleaning the inside of his mouth. Sampson usually does this awhile after he eats. You SHOULD be brushing his teeth. Get a doggie tooth brush and paste and start to do it regularly. There is a post on this site about it… I’m guessing the odor you are smelling has to do with that. Concerned, I had a cat that did that. She had a bad tooth.just a thought hought, hope it helps! That’s exactly the case w my baby Beanie. Not only did she lick but her breath was real bad. She had 4 rotten teeth that were removed this morning from improper nutrition from her previous owner. So I’d have her teeth checked for sure. Toothpaste for Dogs – Brush their Teeth! I could’nt imagine my life without my minnie red doxie Mitzi. She is the sunshine of my day. I suffer from depression and no matter how I’m feeling that day, she makes my world a better place. I love when she licks me. We call them Yum Yums and it always makes me smile. Looking into her beautiful brown eyes, I can see and feel so much LOVE!!!! She understands when I talk to her, it’s amazing. Not to mention the laughter she brings me. I am so blessed for her to be my best girl. They do have loving eyes… very unique. I’m glad that you are coping with your Mitzi! Just got a mini doxie, Falco, and I was wondring why he licked my face everytime we came back from potty or walk 🙂 My first time being the pack leader & learning lots about Falco, but mostly SO much about myself. I can’t believe how quickly he has adjusted to life in our “pack” & wonder how we have gone with out him all this time :)) Can’t wait to read more here!! I have just adopted (2days ago) a mini rescue dachshund, believed to be 5 years. This is my 11th mini over the years and she is wonderfully loving and cuddly but I’m having questions about play time. She doesn’t show any interest in her squeaky toys or ball, even when I am on the floor with her. Is this something I should worry about? Our Dachshund doesn’t really like toys that squeak. He sometimes likes his various rope toys, or his hard plastic chew bone, and often times an old sock. Haha and my mini frank would play with a ball and squeaky toy literally non stop all day and night if I let him! Love seeing other sausages I imagine them all to be the same but obv not. i had a foster doxie who had no idea how to play with toys. the home he came from pretty much ignored him and didnt have any toys for him to play with. i just worked with him a bit and eventually he learned, but he is still far less interested in them than my non rescue dogs. I agree with everyone who says there is nothing like a Doxie. I just had to have mine put to sleep and I have never been so loney. They are wonderful companions. Now, I am searching everywhere for another one. She was a miniature. Longhair. What a sweet girl! I am so sorry for your loss, I know how it feels (as many of us do, I’m sure…). It’s a terrible thing, but eventually the emotional pain subsides. please check out drna.org they are the best doxie rescue out there! We just lost our sweet little boy, Gus on Feb. 3, 2013. He was the sweetest little heart and we are so broken hearted and sad. I am so sorry for your loss as we feel if too. my dach ….is cool he understands words like lets go , even in his sleep if he hears these words he would stand up as fast as i can n would bring in his leesh or my slippers hes so fond of walking outside . he loves to lie down on a mat n when iam not seeing him he would try eating it and when i call his name seeing him eat he stops immediately n make his face lie on the floor . Our doxie always greets us with one of his toys in his mouth or his bones. When we get home he always runs and gets a toy before running to us wagging his toy and making his squeaking sounds. Thank you much for that info. we just got dachsund mix and she is the most affectionate dog we have had. she not only licks our face but she licks everywhere. now we understand why and we thank you. I had dachshunds when I was younger & when I got married. They are so loving but this one I got now she is so loving she will lick us but if we are talking or busy doing something she will come & lay her face right on our mouths so we can’t talk or anything. Lol we haven’t figured out why she does that because she gets a lot of loves & attention all the time. OMG! This makes so much sense. We have a little black dachsuhnds named Duckie that is always licking our faces, arms, feet, and all other parts of our body. and he is licking himself right now as I type this post. Sometimes he is so uncontrollable and goes crazy with the licking lol. Ours is the same. Sometimes it,s annoying.anything we can do to slow it down. I have a nine month mini ….. he is always licking us when he sits beside us. It is a bit excessive. I have had two other mini’s for 17 years . They were one year apart. Cooper, seems to not be able to relax and settle down , always into something , …… he seems very head strong …l took him to training classes but he still seems to get into everything ….. at what age will he settle down ? We have a doxie named Libby. She licks us so much that we call her Licky Lou. So many things here are similar and so fun to read – things like how loving and sensitive they are. She especially loves to lick our feet. We call that getting a “feeties” in our house. She does love to play on her schedule, usually when we are sitting down at night, she is the guardian of the house with her barking and the sweetest girl in the world. My mini long haired doxie is 4 months old. She doesn’t eat very much. The breeder said to let her eat when she wants to. I give a scoopful in the morning and it takes her all day to eat. She’s active but loves to eat anything she can find outside. Is this common for puppies? She will chew on twigs and catch bugs and eat them. Today she regurgitated a piece of plastic. I don’t know what to do at this point. She has grown a little and loves to play. I wonder if this is normal for her. Any advice will be greatly appreciated. Sally once are a piece of plastic and we couldn’t get it out. We took her to vet and thousands of dollars later she was good to go. Never take them out without a leash and keep her away from kitchen trash. There’s nothing like a Dachshund!